"Freakin' whiney babies...", Hellboy groused, buckling his right sode. "Excuse me?" Abe piped, eyelids flicking in confusion. He did that thing with his head, the thing that reminded Hellboy so much of a puppy, tilting it sideways. "Ya know, all the whiney babies back at the Bureau. Those guys who've gone back in time, or traveled through space..." Big Red finished with the massive square piece of shoulder armor and then looked from his fishy friend, glancing towards his other, still unprotected shoulder. There was NO WAY he was going to be able to fasten on the left-side sode with his massive Right Hand. Abe Sapien, studiously perceptive and emotionally sensitive as ever, immediately picked up on his best friend's discomfort, and helped affix the samauri-armor. 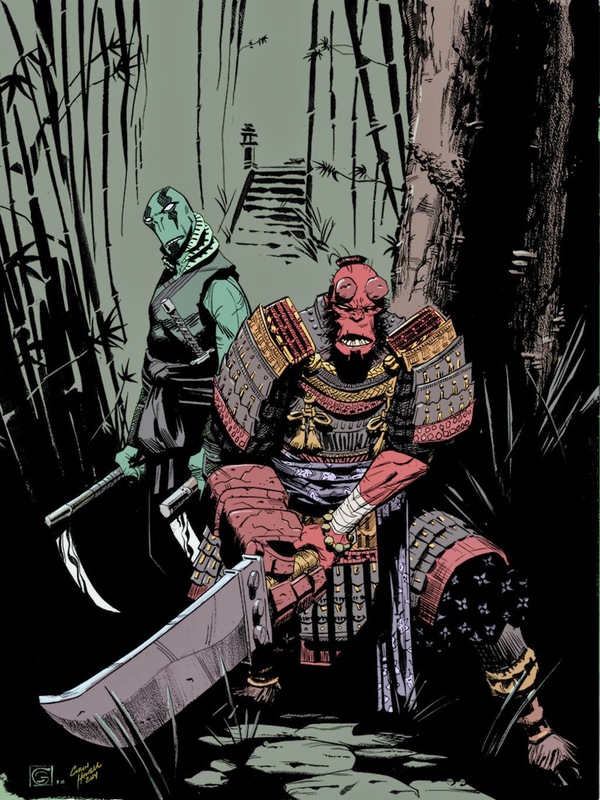 "Yes, but I-"
Hellboy continued rambling right over Abe's words, "...and how they're always croonin' on and on about how careful they had to be not to disrupt the time stream, or the cosmic confluences, and all'a that crap." "Well, here we are, in a whole different freakin' Dimension, AND we've been thrown back in time AND space to boot." Hellboy chuckled. It was the sound of pumice rocks being tossed into a rock-grater. Abe blinked, now thoroughly confused. B.P.R.D. 's most secret and valued weapon glanced at his blue-skinned brother-in-arms, his yellow eyes gleaming with mirth. "Ya don't here us complainin', and we gotta take out the Emperor of the whole freakin' place!" Abe Sapien blinked again, picking up twin kamas that had been left for him by said Emperor. The weapons he held, and the katana in his sash, had been especially crafted, selected, and left for him for just this purpose. "An assignment which has me somewhat concerned, actually. What if this was nothing more than an elaborate ruse? Logically, if what we've been told is true and if the principles of logic operate in the same manner in this Dimension as in our own--if we destroy the Demon Emperor, will not his entire demesne completely vanish?" Abe gulped, but Big Red could not tell if it was out of fear or lack of oxygen. "Taking us along with it?" ...and he was just the guy to do it.